I'm a wee bit jealous of those of you whose kids are out of school already! Our last day is June 14, which right now seems so far away. 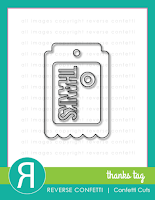 Looking on the bright side, the extra weeks do give me time to craft a few more teacher thank-yous. 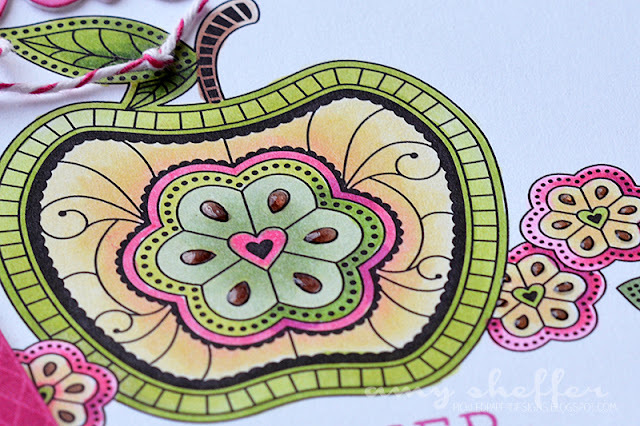 This lovely apple is from Betsy Veldman's What the Doodle: Apple collection by Papertrey Ink. I love that all of the What the Doodle collections (this is a monthly series) offer stamps, dies, coloring sheets, and watercolor sheets. I used one of the What the Doodle: Apple Coloring Sheets for this card, and the coloring is all with Copics. 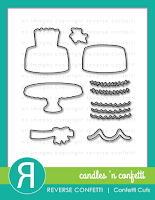 Along the top of the trimmed-down coloring sheet is a word die-cut from Wet Paint Cuts die set. I lightly inked it with Raspberry Fizz ink using a sponge dauber. Here's a closer look at the coloring, and you can also see how I added some Glossy Accents to the seeds. 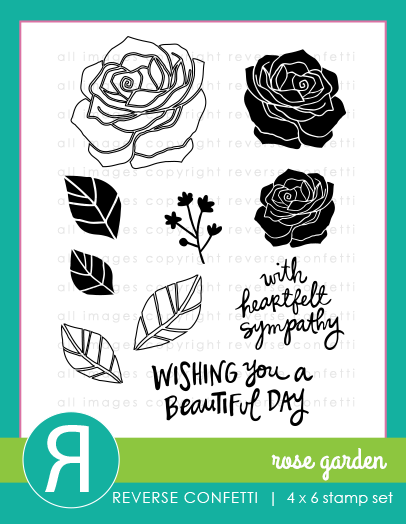 Along the bottom, I layered some tilted panels in varying patterns and colors using Raspberry Fizz and Green Parakeet card stock, True Black Gingham patterned paper, and Pencil Me In patterned paper. 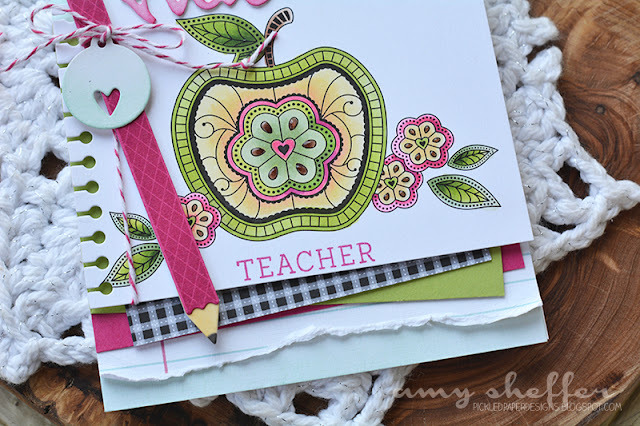 The pencil accent was done with Pencil Me In stamps and dies. too. 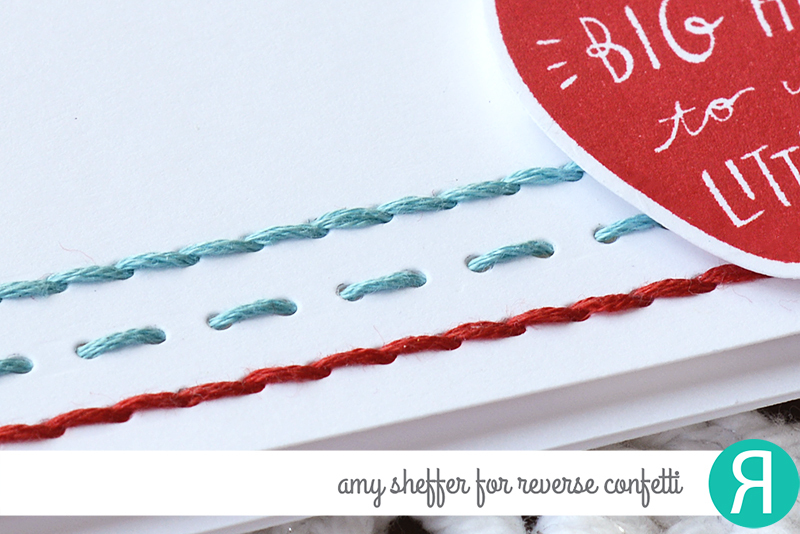 I tied on a Tiny Tags die-cut using some Raspberry Fizz baker's twine. 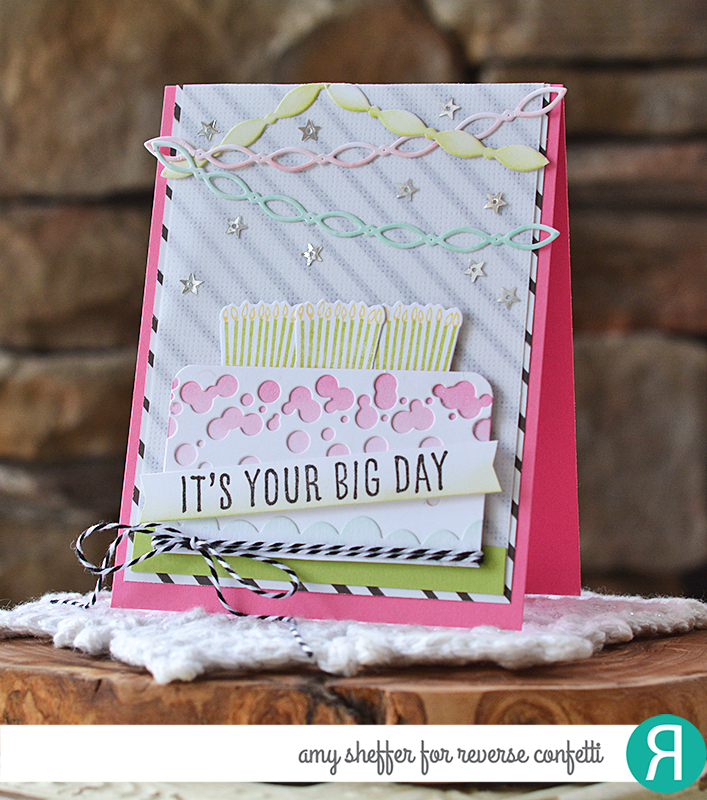 The Reverse Confetti design team is joining CardMaker Magazine today for a blog hop! 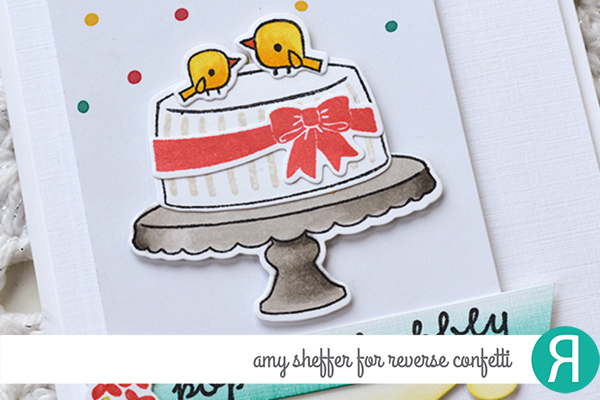 Hope you'll hop along with us for lots of card-making inspiration! 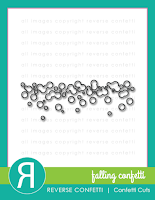 As part of the hop, there is also a giveaway over on the Reverse confetti blog. 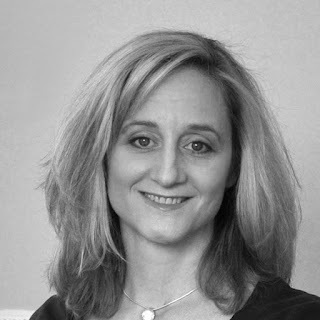 If you're already following the hop, you will have arrived here from Kim Klinkovsky. 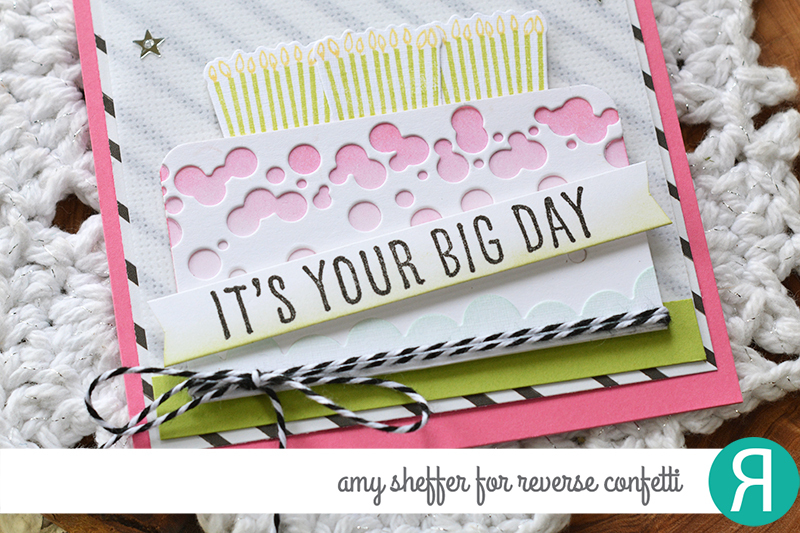 If not, head over to the CardMaker Blog to get started. (The full hop list is posted there, too.) When you're finished here, Lisa Henke will be your next stop (I'll link to her again at the bottom of this post). You have until May 29 at noon CST to link up your entry. 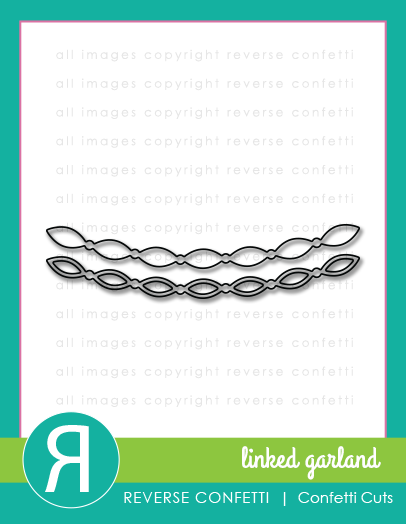 A $20 gift certificate goes to this months 'Fetti Fave -- will it be you? Challenge details and link-up are posted HERE. 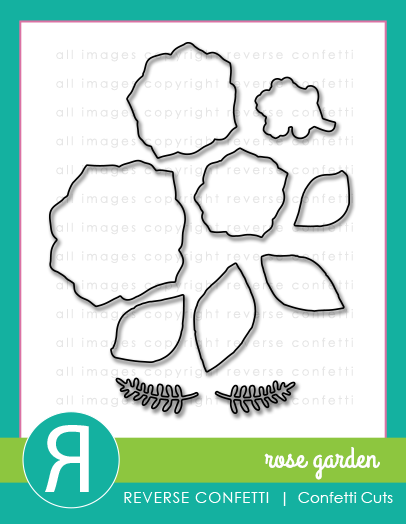 For my card, I started with some stamped and die-cut roses and leaves from Rose Garden. The roses I used are solid images, so to add depth, I shaded the petals using Copic markers. The leaves are line art images. 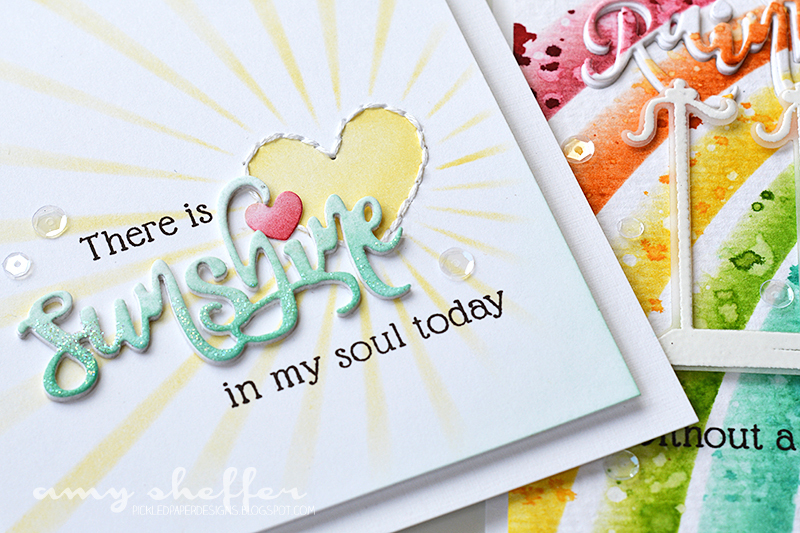 I heat embossed in white, then added color using sponge daubers. 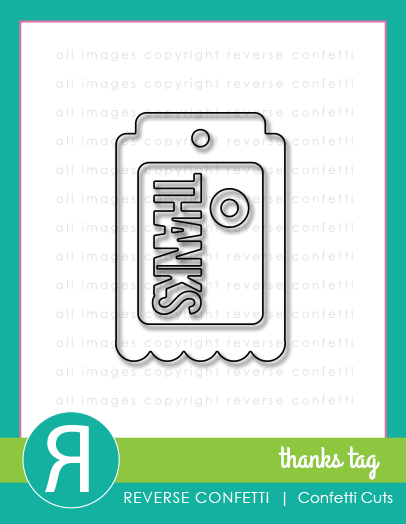 I arranged the flowers on a charcoal gray Thanks Tag. The sentiment, from Posted Note Sentiments, is stamped onto a notched banner flag and popped up over the flower cluster. 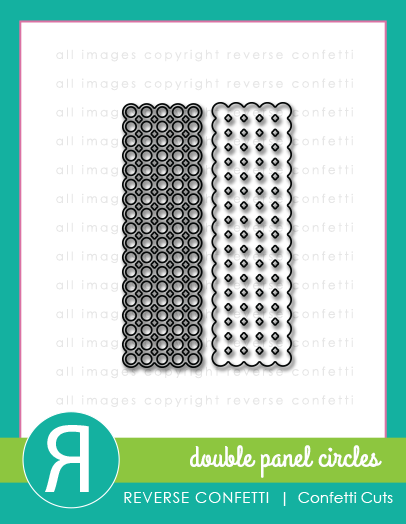 For the two-piece vertical strip, I went with white-on-white Double Panel Circles Confetti Cuts strips. Last, I embellished with some white satin sequins and some white linen thread. Thanks so much for visiting! Your next stop is Lisa Henke. Enjoy the hop! 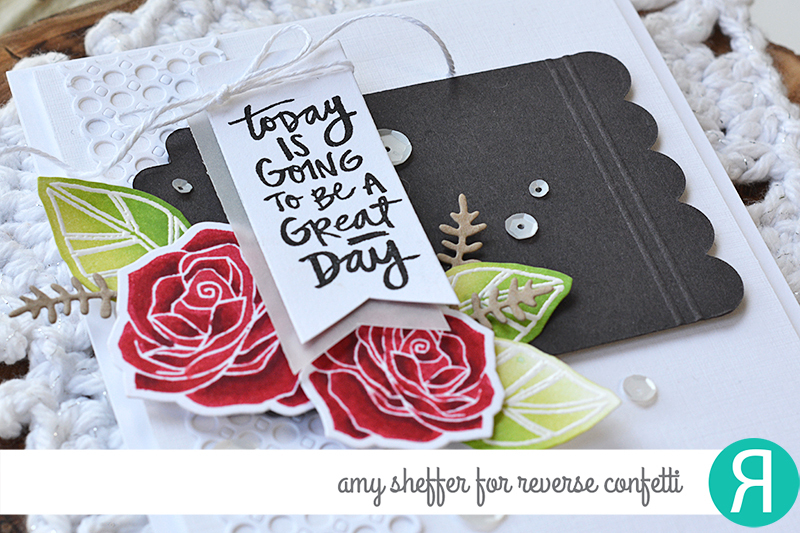 I'm on the Reverse Confetti blog today with this week's Wednesday in the Works feature. 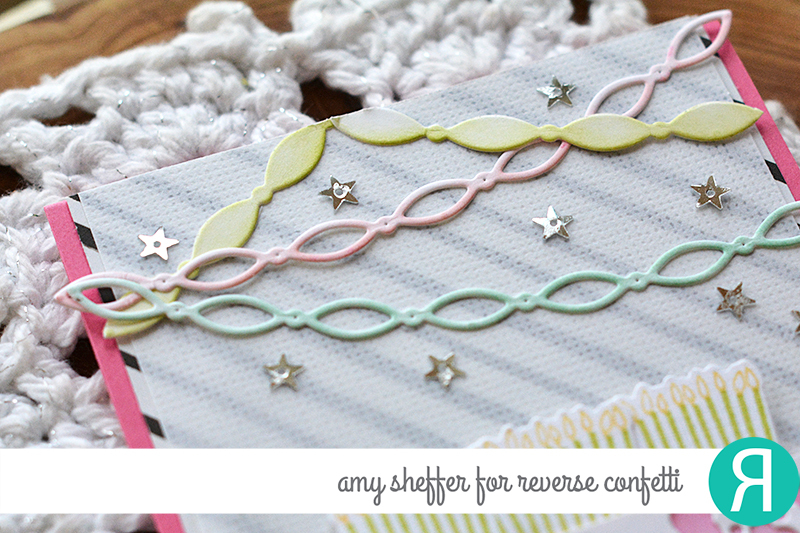 Hope you'll join me there for a creative stitching idea using Edge Essentials Confetti Cuts. For now, here's a little peek! 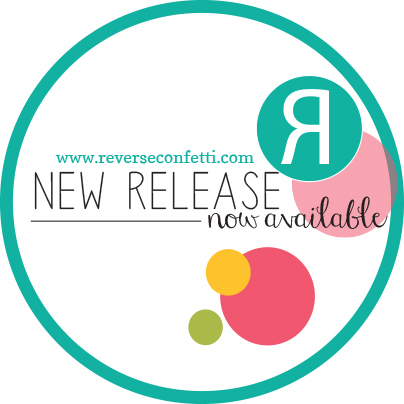 Do you know Reverse Confetti has a newsletter? Sign up today for release news, contest announcements, product availability updates, and my favorite, Inspiration Station, a newsletter-exclusive weekly feature brought to you by the Reverse Confetti crew. The newsletter goes out on Fridays. 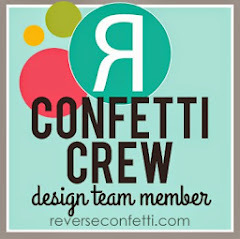 If you're not already signed up, you can do so right on the Reverse Confetti home page. The peek you see above was inspired by a dish towel! Watch for your newsletter tomorrow for more photos and my creative process! 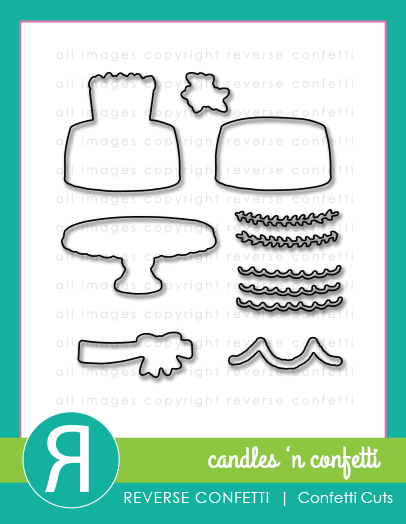 Reverse Confetti's May release is filled with such fun papercrafting goodies! 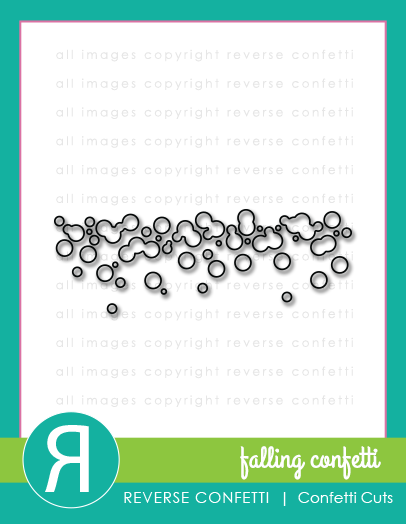 I'm especially enjoying the Falling Confetti Confetti Cuts die -- so many possibilities! 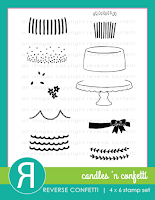 Here, I made a white rectangular cake base. The back layer is sponged in pink ink. The front layer is cut with the Falling Confetti die, allowing the ombre pink sponging to show through. 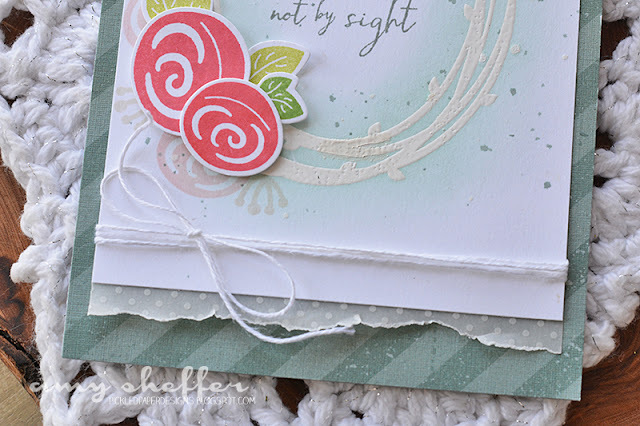 Along the bottom, I added some frosting with the Double Edge Wonky Scallop Border Confetti Cuts die. 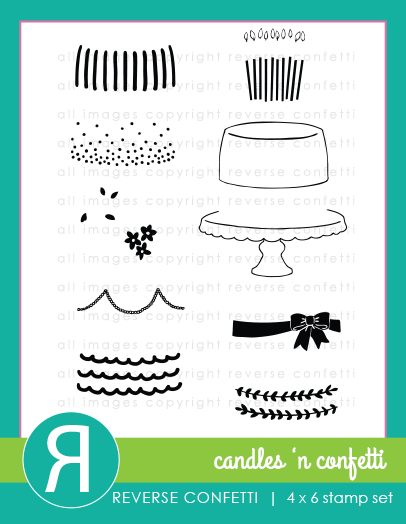 The candles are from Candles 'n Confetti, and the sentiment is from Celebrations. At the top I added some streamers that I die-cut with the Linked Garland Confetti Cuts dies. 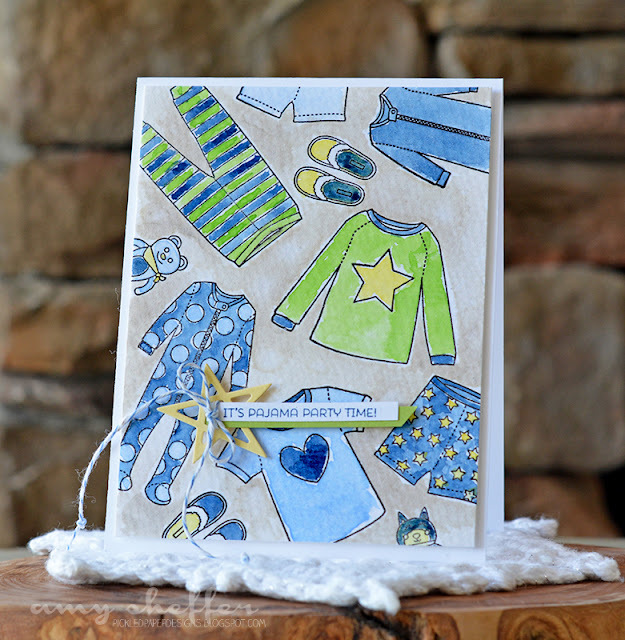 I have a few more Papertrey May release projects to share, beginning with this super cute pajama set by Erin Lincoln called Sweet Dreams. 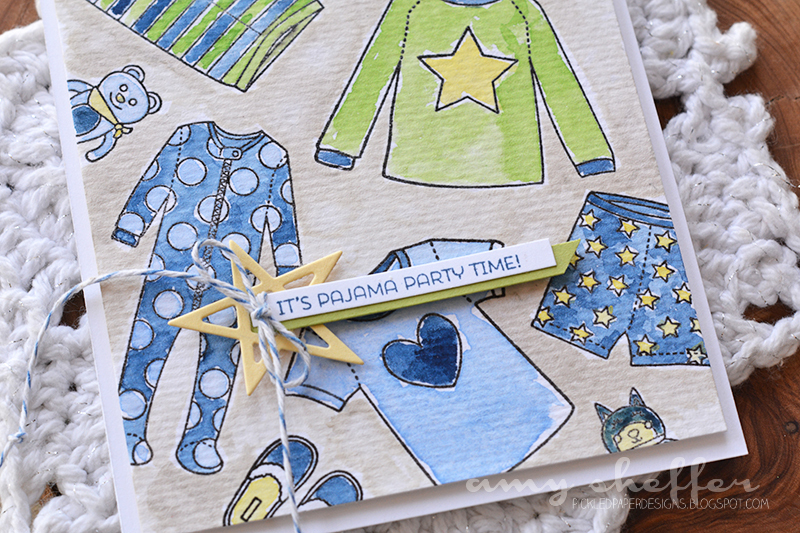 I just adore these sweet pajama images! The random stamping and loose watercoloring were inspired by this darling card that Kristina Werner posted recently. 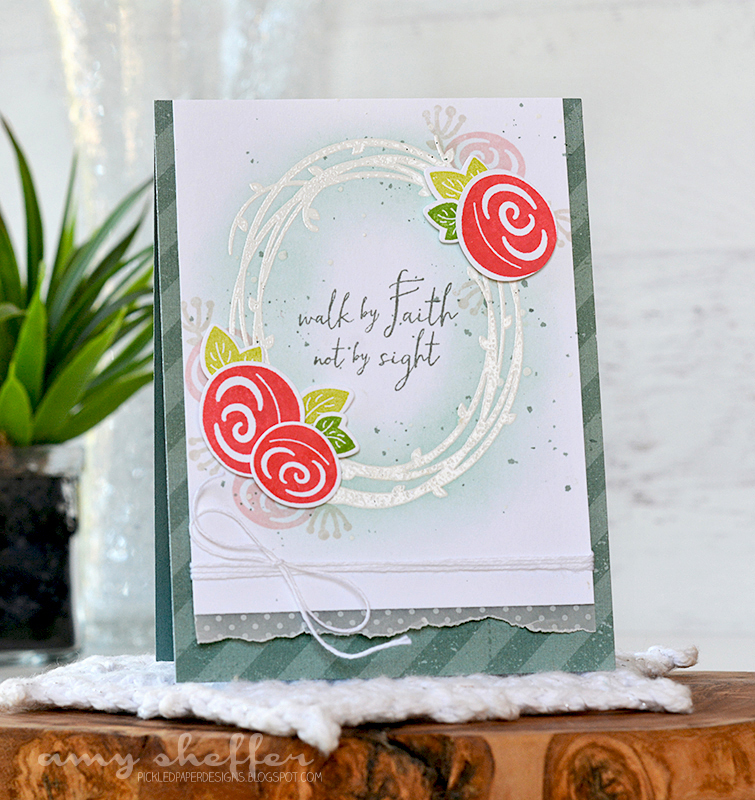 Here I've combined Walk by Faith, designed by Heather Nichols and Paper Clippings: Thinking of You, designed by Betsy Veldman. 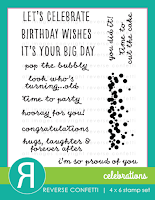 I heat embossed the Paper Clippings: Thinking of You wreath in white, then sponged on some Aqua Mist ink and splattered Ocean Tides and white ink. 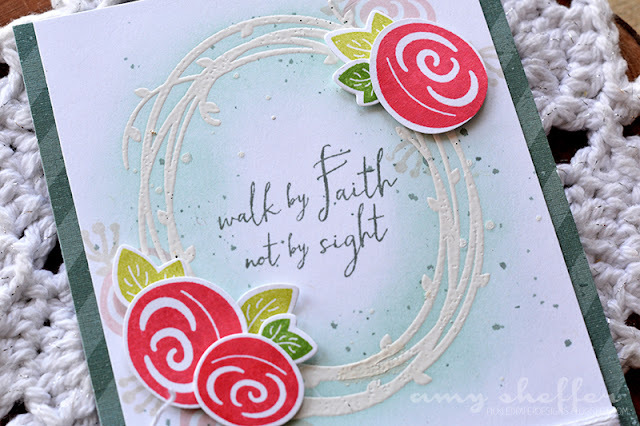 The sentiment, from Walk by Faith is stamped in Stormy Sea. The flower accents are from Paper Clippings: Thinking of You. Along the bottom I added a bit of torn Sheer Basics vellum and some white linen thread. The Ocean Tides stripe patterned paper is from the Twig Wreath paper collection. 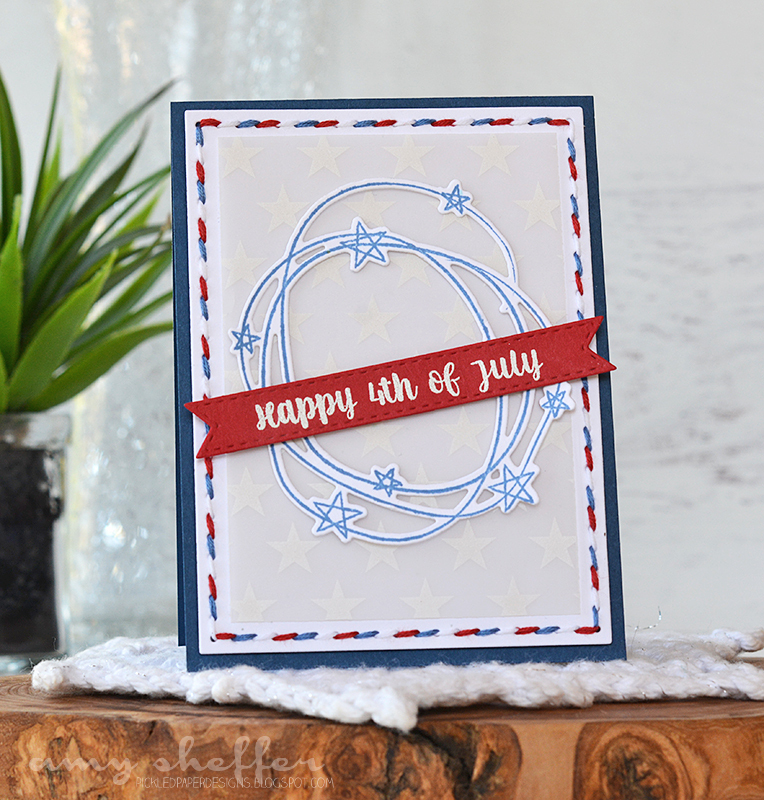 And last is a fun 4th of July card. The sentiment is from Keep It Simple: Bless the USA. and is stamped onto a Pure Poppy Tag Sale: Quilted banner die-cut. Behind that is a Star Scribbles stamped die-cut. 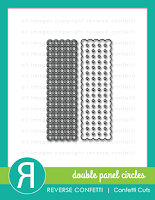 The background panel is a Stitched Rectangles die-cut. 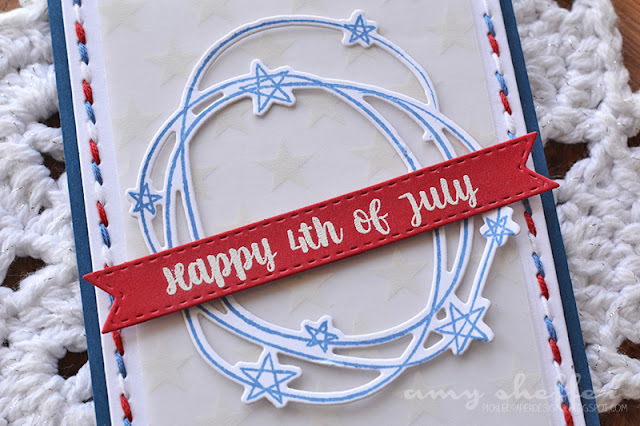 I stitched a red, white and blue border and topped it with the star print from the Sheer Basics vellum collection. Thank you for all the sweet comments during the release countdown, and thanks for visiting today! 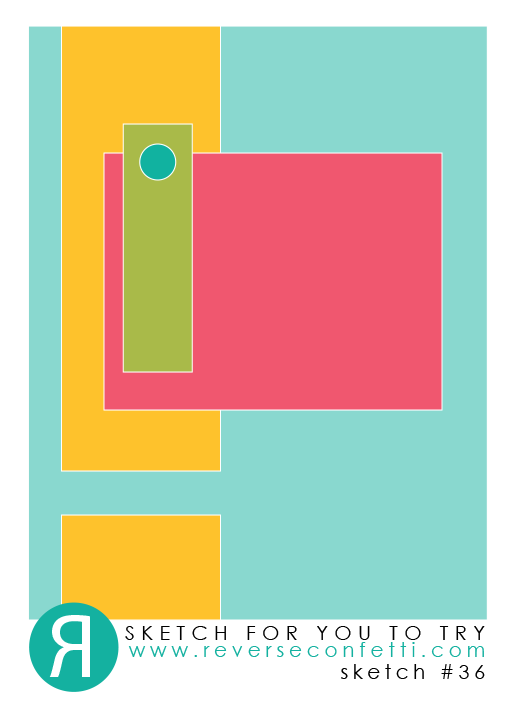 I've combined a few products on this first card. 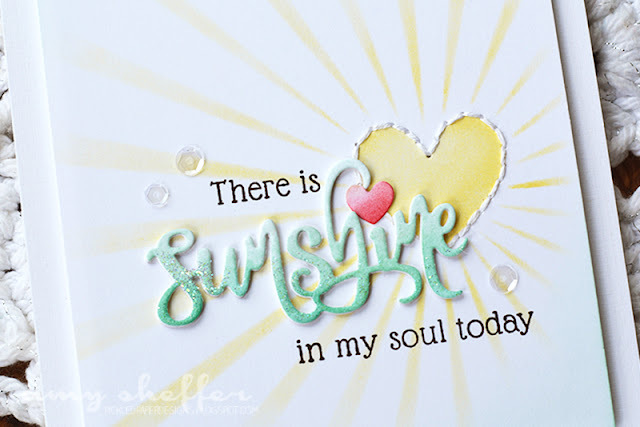 The sentiment is from Betsy's Inspired: Praise. 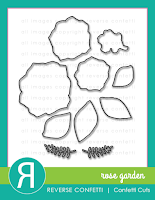 The leafy frame and flowers are both Garden Garland die-cuts that I watercolored. 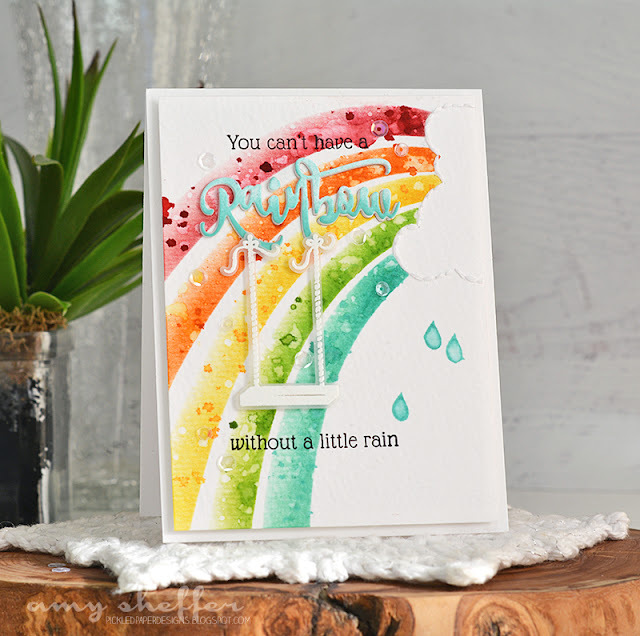 The background watercolor panel was done with one of the stencils from Betsy's Make It Market Mini Kit: Sunshine & Rainbows. 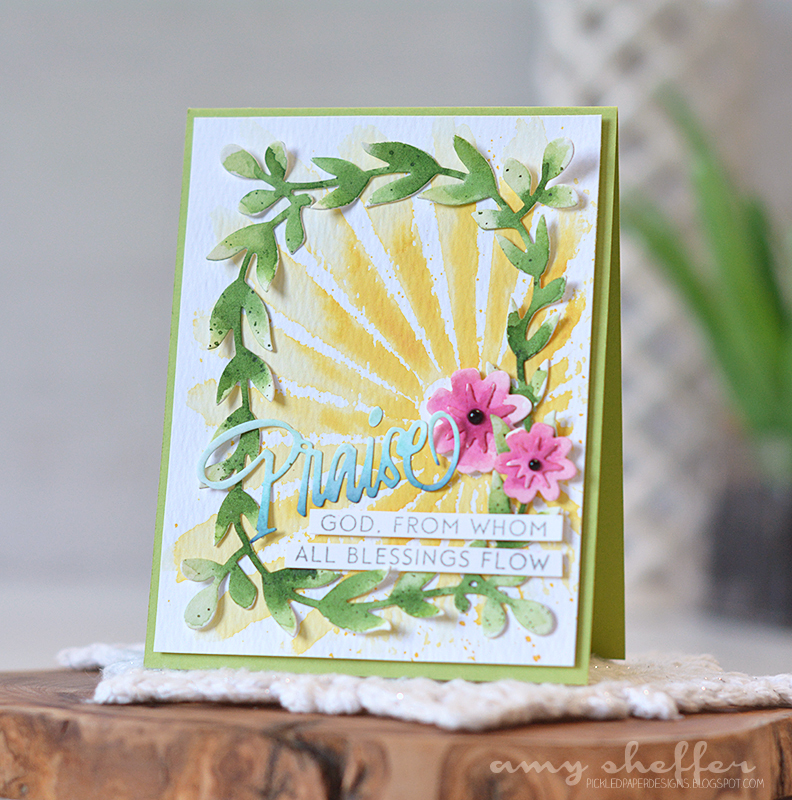 For the background, I inked the back of the stencil with Harvest Gold and then stamped with the stencil. Next I used a brush and added water and some extra Summer Sunrise ink. 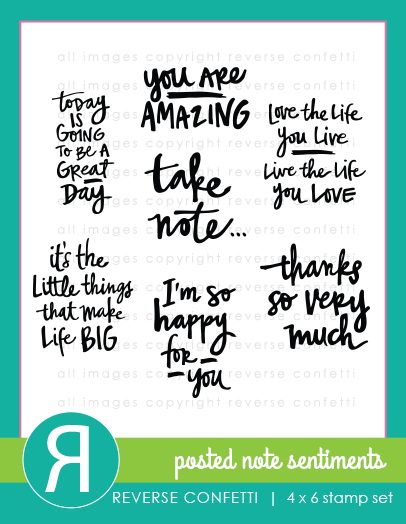 I love the different look you get using the stencil this way! Next up is Maile's Splits: Thank You. I think this Splits is my favorite one yet! 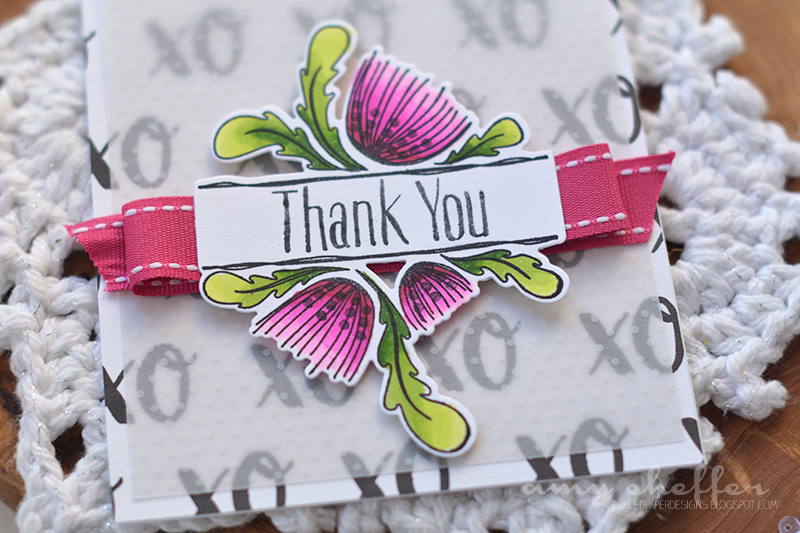 I stamped in black ink onto a Splits: Thank You die-cut, then colored with Copics. 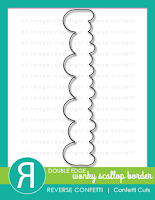 The die-cut is popped up over some pleated Raspberry Fizz ribbon, then adhered to a panel of Black and White All Over paper collection that has been topped with Sheer Basics vellum. 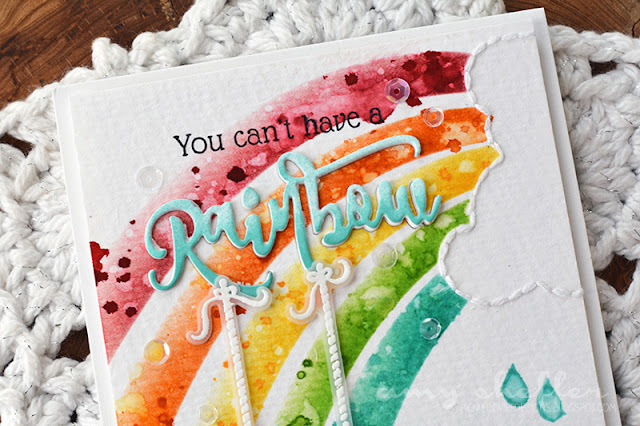 Papertrey's May release countdown continues today with a colorful Make It Market Mini Kit called Sunshine & Rainbows, designed by Betsy Veldman. 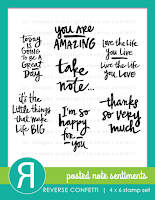 Just like with her color pop collections, this kit comes with stamps, dies, papers and stencils. 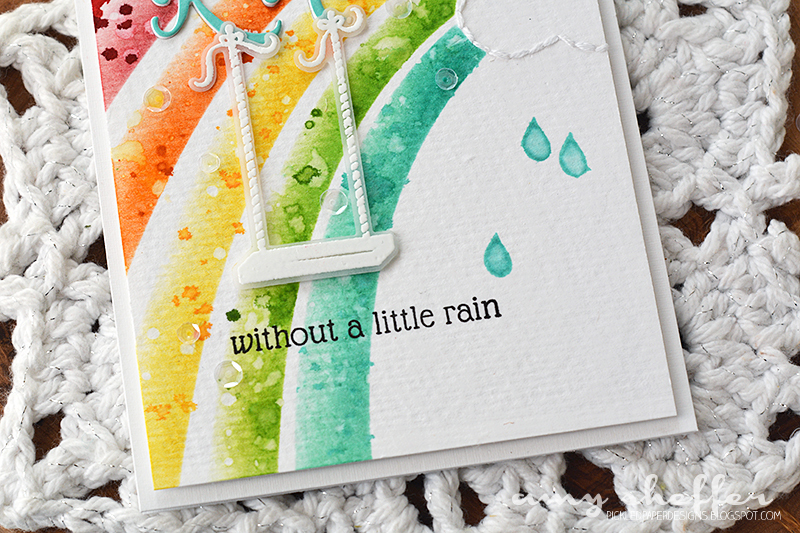 I love crafting with sunshine and rainbows! The warmth and the color are just irresistible! Sunshine & Rainbows, along with the rest of the May release, will be available at 10 pm ET on May 15 in the Papertrey Ink store. 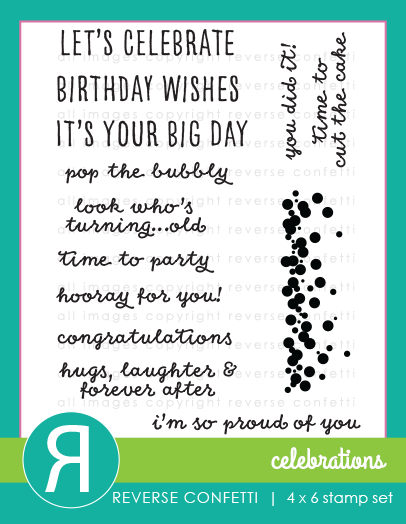 For my first card, I went for a soft and sweet look. I used the sun stencil for the background, then just added the word die-cut, stamping, and a few sequins (included in the kit, by the way). For added interest, I used the stencil as a guide to paper pierce around the heart, so that I could add the hand stitching. I also really, really lightly inked two of the corners with Aqua Mist ink. Next is a fun, more artsy-looking rainbow card. For this one, I used one of the stencils to ink the rainbow. As I inked, I masked off the other colors, so that I could splash with water and then spritz with re-inker. Once again, I added some hand-stitching, this time around the clouds. The sentiment is a combination of stamping and a word die-cut. 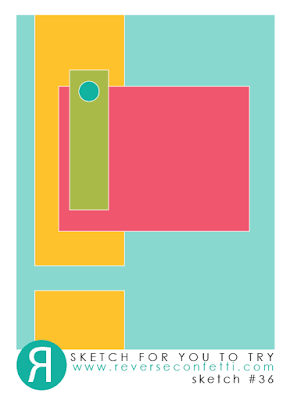 For the word die-cut, I stacked a few white die-cuts together before adding the ombre turquoise die-cut to the stack. 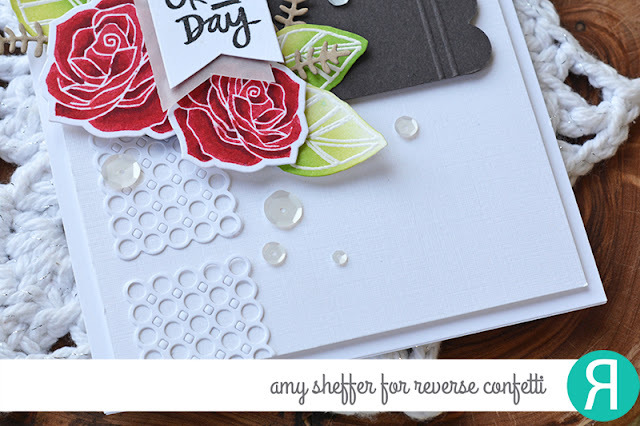 Last, I added a swing die-cut that I heat embossed in white, some stamped rain drops, and some clear sequins.